Note: This article was originally written in 1994, published in The Annals of Saint Anne and later in Active Christian News. A portly man with a white beard, wearing a flannel shirt and suspender-supported blue jeans, pumped gas into his car. My then two-year-old son Matthew watched through the car window. “Who is that, Matt?” I asked. The man noticed Matthew’s peering eyes and waved. We saw the man again a year later as he exited a delicatessen we were approaching. This time he wore a tuxedo with a shocking pink bow tie and cummerbund. Perhaps this was the day of his daughter’s wedding. As we passed, the man winked at Matthew and asked me, “Has he been good?” Obviously, he knew whom he resembled and enjoyed playing the part. Every December, the man spent his free time attending preschool and Sunday school Christmas parties. He assumed the role of guest of honor at my children’s preschool. Wearing a finely tailored red velvet suit and cap trimmed in white plush, with black leather belt and boots, wire-rimmed glasses, white gloves, rouged cheeks, and his home-grown full white beard, he appeared to be the genuine article, not a department store imitation. Some might say the man really epitomizes the spirit of Christmas. 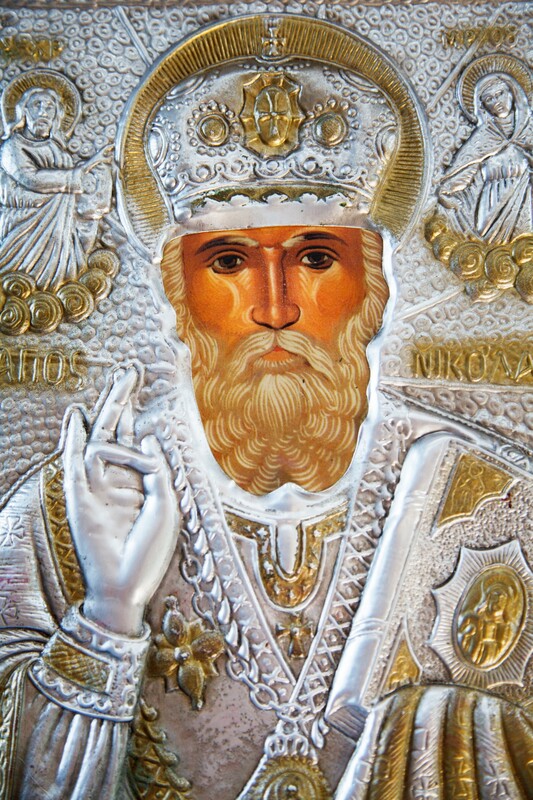 Yet, he’s a mere caricature of the original Saint Nicholas, the legendary fourth century archbishop of Myra in Asia Minor (now Turkey). As the story goes, a poor man had three daughters, for whom he could not provide dowries. He agonized over their fates should he die. With no father, brothers, or husbands to support them, they were doomed to lives of poverty and degradation. Nicholas, aware of the poor man’s dilemma, tossed three sacks of gold through the family’s window in the middle of the night. 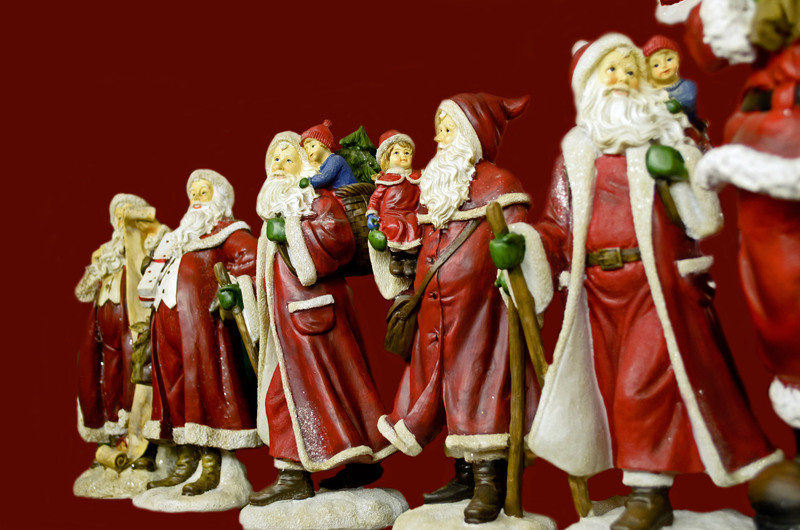 Out of this folklore grew the custom of surreptitious gifts on Saint Nicholas’ Day, December 6. Eventually, someone (no doubt an advertising executive) got the bright idea of combining Saint Nicholas gift-giving with the celebration of Christmas. Sadly, many people measure their self-worth by the quantity of presents they receive. Nothing could be more pitiful than not getting any gifts at all. Feeling guilty about the poor and the homeless who might not experience any Christmas bounty, we look for ways we can contribute. Charities increase their appeals during the Christmas season. Many collect more money during the period between Thanksgiving and New Year’s than during the whole rest of the year. Sadly, the same shelters and food banks that were inundated with offers of good cheer in December get almost no attention in January or August. The original Nicholas gave three dowry-deprived girls what they needed for a bright future. He wasn’t merely concerned with giving toys to underprivileged children. His motivation was changing lives, bringing hope where there had been despair. Nicholas’ own model was Jesus, the man whose birth we celebrate on December 25. Jesus described His life’s goal with these words: “…I came that they may have life, and have it abundantly” (John 10: 10b ESV). The abundant life Jesus offers is eternal life, with God, not earthly possessions. And that’s the true spirit of Christmas. This entry was posted in Christmas, Gifts, Holiday, Jesus, Santa and tagged Christmas, family stories, St. Nicholas, traditions. Bookmark the permalink.